Since my recently knitted purse expanded my knowledge of knitting with beads, I thought I would try and take it one step further-paint with them. The above photo is of an evening bag flap that will cover the hex frame and lay smoothly to about 1 1/2 inches from the bottom edge of the purse. The design features the letter”T” in the middle, with various swirls etc to complete the shape. In order to accomplish this I had to come up with a method that did not interfere with the gauge, and yet allow me to insert beads every stitch if need be. Hummmm……..????????????????????? Let see–,using the slip stitch method on YOUTUBE requirew first pre-stringing your beads onto the yarn; then work to where you want your bead, bring your yarn forward, slip the stitch purlwise, lay the bead at the base of the slipped stitch, then bring the yarn around the back to knit the next stitch. So what’s the problem with that?? Well, the problem is that you can’t line up your beads together, you can only put them in every other stitch. The next method uses a crochet hook to go through the bead, and bring the newly knitted stitch through the bead hole before replacing it on the right knitting needle. This method does not require you to pre-string the beads, however, you can’t stack them or place them every stitch without greatly changing the gauge of your knitting. Well, that won’t work! So what to do????? 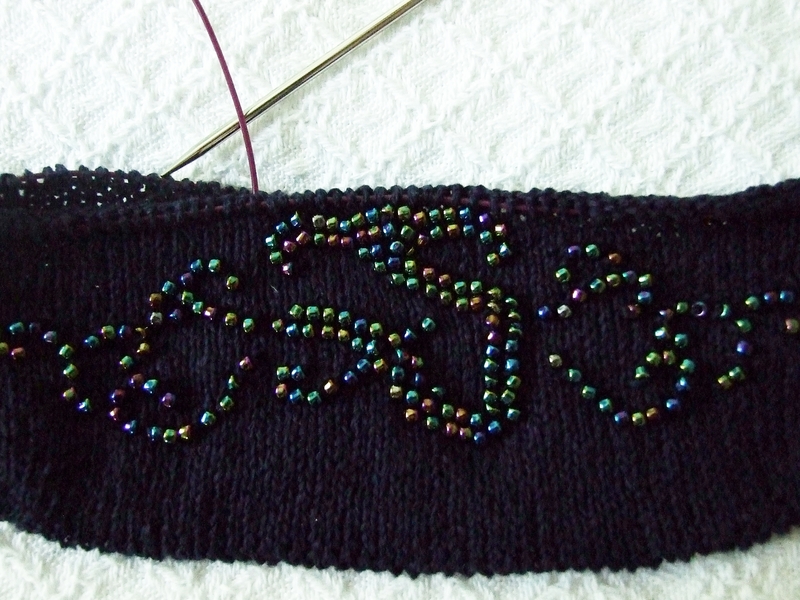 I want the beads to set on top of the knitted surface, so they will not affect the gauge. I want to be able to chart my design. I don’t want to have to count stitches and rows in order to put them in, if I wanted to do that I would do counted cross stitch. I want to be able to tweek them a bit if needed to make the design. After playing around a bit, beginning with the idea I shared with you in the lace curtain design, I came up with this. You can call it whatever you want. The nice thing is it works, as you can see in the photo above. I have added some illustrations to make this process more clear. I know you will come up with your own great ideas.